We have not had much luck in choosing the companies we write up in our Quarterly Commentaries recently. Last quarter we wrote about Asaleo Care on the eve of an unexpected profit downgrade and a 35% collapse in the company’s share price. In December 2017’s report we wrote about Sigma Healthcare and the risks surrounding its largest customer, Chemist Warehouse, terminating their relationship with Sigma. Unfortunately this is exactly what has happened. Its share price has fallen by over 20% since we wrote about it. 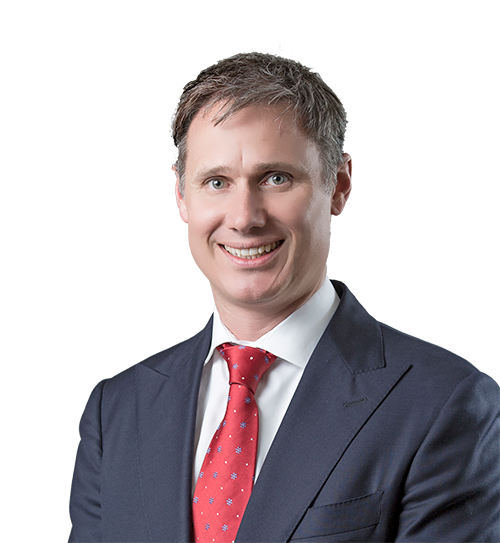 It is not unusual for us to invest in companies that go on to significantly underperform the broader sharemarket. In fact, this happens to us 40% of the time. It is the other 60% of the time and what we do on the back of a significant fall in the price of an investment that really counts. Investing is risky and it comes with both hits and misses. Wayne Gretzky, the famous Canadian ice hockey player once said “you miss 100% of the shots you don’t take” and this is equally true in investing. In this extract from the Quarterly Commentary we cover a third shot of ours, Sims Metal Management. Hopefully this one finds the goal mouth. Sims Metal Management Limited (Sims) is a metals recycling company with operations in the United States, Australasia and the United Kingdom. Sims buys ‘feedstock’ – ferrous metals (materials containing iron) from metals dealers, peddlers, auto wreckers, demolition firms and various manufacturers who have metal offcuts which can be recycled. This scrap is processed and separated into product streams that are capable of being reused and converted into everyday products. Much of Sims’ processing is initially performed by mega shredders shown in Figure 1. 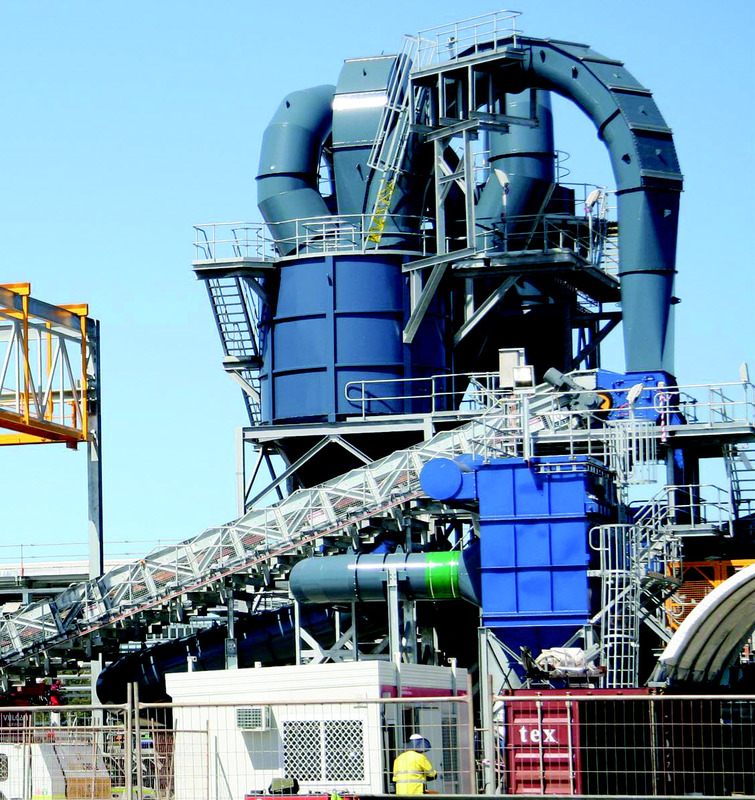 Once shredded, the metals are separated using particle size screening, eddy current separators, magnetic separation techniques and various sensors. Once the metal feedstock is fully processed, Sims is left with a ferrous product stream and various non-ferrous product streams. The ferrous product is an internationally traded commodity and is sold to electric arc furnace steel manufacturers around the world who use scrap steel as their primary raw material input. This method of steel production accounts for about 30% of the world total (with the remaining 70% coming from blast furnaces which use iron ore as their primary raw material input). The US and EU are the largest exporters of ferrous scrap but they are also large consumers of it for their own steel mills. Turkey’s steel manufacturing industry is the world’s largest importer of ferrous scrap. Sims sells the non-ferrous product streams (aluminium, copper, magnesium, etc.) to metal smelters and processors around the world. China is a large importer of these products. Sims also has a Recycling Solutions business that provides global electronics recycling and technology asset disposal. Chart 1 shows Sims’ 2018 revenue split by country and product. About two-thirds of Sims’ cost base is made up of raw materials costs – the amount it pays peddlers and dealers to supply the metal scrap feedstock. If well managed, these costs flex with the market prices of Sims’ end products. When ferrous scrap prices fall, Sims pays peddlers less for obsolete scrap so as to protect its processing margins. This relationship is not unique to Sims. The technologies used to process scrap metals are also widely adopted and don’t provide a source of competitive advantage. But they are capital intensive and are expensive to run. Good recyclers have a ready and constant access to metal feedstock supplies, enabling them to run their processing plants near full utilisation rates and benefit from the ensuing operating efficiencies. To achieve this, proximity to metal peddlers and aggregators is important and is one source of competitive advantage. Logistics and freight costs are also a significant cost for metal recyclers. Easy and cheap access to end markets is a second source of competitive advantage. This either involves being strategically located near processed scrap metal consumers (mainly steel mini mills), or near port and rail infrastructure so as to minimise logistics costs. Sims’ facilities are world class. They are close to both the originators of obsolete metal feedstocks and have competitive access to end markets for its products, primarily via its deep water ports which service export markets. Sims’ share price has fallen almost 30% from its recent highs on the back of two developments and their potential future implications for Sims. This is shown in Graph 1. Turkey, the world’s largest importer of ferrous scrap, is experiencing significant economic difficulties with rampant inflation and loose monetary policy contributing to a depreciation in the Turkish Lira. It is unclear what impact this will have on domestic steel demand and therefore Turkey’s continued demand for ferrous scrap. Turkish steel mills are a large customer of Sims’ and account for 18% of Sims’ ferrous sales volumes. To make matters worse, political tensions between Turkey and the United States have resulted in Donald Trump doubling steel and aluminium tariffs on Turkish imported steel. The second development relates to China, a large importer of non-ferrous scrap products. In recent environmental clampdowns, China has banned the import of a number of scrap and waste products and strengthened the quality requirements for other products. This has impacted demand for scrap paper, plastics and high impurity non-ferrous scrap products which metal recyclers had previously come to rely on as income streams. How does this impact Sims? Turkey’s economic situation, whilst a near-term headwind, is unlikely to be permanent. Steel is an internationally traded commodity (as is the ferrous scrap used to make it). It is quite possible that any domestic demand declines could see a greater proportion of Turkey’s steel exported without a significant reduction in the country’s demand for ferrous scrap or its domestic steel production. The changes in China are likely to be more permanent and, with a bit of luck, increasingly adopted by other developing nations. Sims appears to have foreseen this trend and has already invested over $100m in its metal recovery processing plants in order to improve the quality of its non-ferrous product streams. 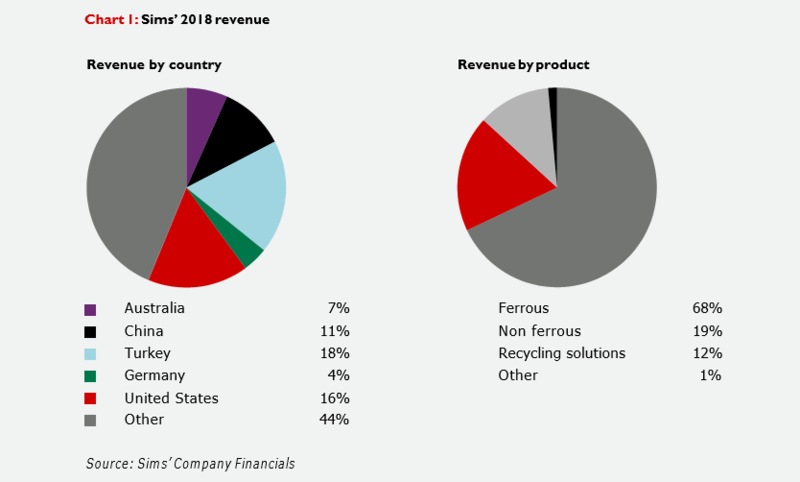 In 2018, 15% of Sims’ non-ferrous volumes were comprised of a low-grade aluminium product (85-96% metal grade) which can no longer be sold in China and instead has needed to find alternative end markets. By the end of 2019, Sims’ product quality investments will see more than half of this volume upgraded further into a 98-99% grade product, which is highly sought after and can not only be sold into China, but even markets like the United States where demand for these product streams is strong. This investment by Sims has further enhanced their competitive advantage, as other recyclers have not followed suit and are stockpiling their low-grade non-ferrous products. This advantage, however, is unlikely to last long, as its peers will also invest in these new technologies in order to remain competitive. The ability of metal recyclers to sell their non-ferrous product streams drives the price they in turn are able to pay for metal feedstocks. Should China and other countries shut its doors to metal imports, with all this recovered metal finding its way to landfill, recyclers will be forced to pay peddlers and aggregators of obsolete metal less for the same raw material feedstock it supplies today. Under this scenario, Sims’ profits may not be impacted at all. This Utopian view of the future won’t always hold though and Sims’ profits may well be negatively impacted. As prices for obsolete metal feedstock fall, the economic benefits of collecting this feedstock will fall too. A tipping point exists where prices are so low that it is not worthwhile for peddlers to collect the metal feedstock in the first place. Sims’ supply will dry up, its processing yards will operate well below capacity and profitability will collapse given the high fixed costs in the business. This happened in 2015 when Sims’ share price bottomed below $7 per share, well below its current share price of $12.65 per share. Whilst possible, current metal prices are well above the levels which would result in feedstock supply concerns, with Graph 2 showing the price of Heavy Melting Steel, the benchmark ferrous scrap price. At over US$300 per tonne, it is more than double its 2015 levels. Sims has a market capitalisation of A$2.6 billion and has $300m of net cash. In the 2018 financial year, it made an operating profit of $280m and it has guided to operating earnings for the September 2018 quarter of $58-63m. Annualised, this $242m in operating profit at the mid-point would result in Sims trading at less than 10 times operating profit. This compares to the broader share market, which trades at 14 times operating profits. The market appears to be pricing in a significant (and permanent) decrease in processing volumes from today’s levels. While the Chinese developments appear to have had some impact this quarter and the Turkey developments do not appear to have had an impact as yet, that is not to say they will not cause greater issues in the future. But it is impossible to know how difficult operating conditions for Sims and its peers will become, or whether scrap flows are destined to dry up. Despite these risks, it is investing during times of uncertainty like this that many of our best investments have been made. We think that today is a case in point for Sims and that the sharemarket reaction has created what we perceive to be a long-term buying opportunity. A beautiful analysis, exhibiting a thorough knowledge. I ave not looked at Sims for a long time, although my late father-in-law worked there. Thanks to Simon’s work, I will now do so. Thank you Eric, we’re very pleased you got some value from the article.